Chef Curtis Stone, owner of the Beverly Hills restaurant, Maude, shares recipes for unique dishes that are perfect for a chilly winter's night. Recipes courtesy of Curtis Stone, owner of Maude restaurant. Make-Ahead: The finished gravlax can be made up to 5 days ahead; store tightly wrapped in plastic in the refrigerator. The rye bread crisps can be made 1 day ahead; store covered in an airtight container. The whipped pomegranate can be made 1 day ahead, covered and refrigerated; rewhip in an electric stand mixer if necessary before serving. The pomegranate reduction can be made 7 days ahead; store covered at room temperature. 1. In a large bowl, mix to combine the salt and sugar. Place half of the salt-sugar mixture in a food processor with the pomegranate seeds, pomegranate concentrate, thyme, lemon, pink peppercorns, and tarragon and blend well. Return the food processor mixture to the remaining salt and sugar and mix to blend. 2. Place the ocean trout sides in a hotel pan and cover with the curing mixture. Set the salmon in the refrigerator to cure for 2 days. 3. Under cold water, rinse the cure off of the ocean trout. Cut each side into 3 pieces. If the exterior flesh is overly salt, using a sharp knife, slice away the flesh that has turned red. Hold the cured ocean trout pieces until ready to serve. 2. Using a deli slicer, thinly slice the rye bread and place on a baking sheet. Bake the rye slices for about 10 minutes, or until the slices are golden and crisp. Store at room temperature until ready to serve. 1. In a blender, combine the pomegranate juice, simple syrup, lemon juice, xanthan gum, and versa whip. Blend on high for 1 minute. Transfer the mixture to the bowl of an electric stand mixer fitted with the whisk attachment. Whisk on high speed for about 10 minutes, or until thick and foamy. Transfer the mixture to a piping bag. 1. In a saucepan over medium heat, reduce the pomegranate juice to a syrup (about 1/2 cup). Store at room temperature until ready to serve. 1. Using a slicing knife, cut the skin from the cured ocean trout. Cut the ocean trout crosswise into 5mm strips. Cut 2 slices per serving. 2. Lay out 8 salad plates. Pipe 6 dots of whipped pomegranate around each plate. 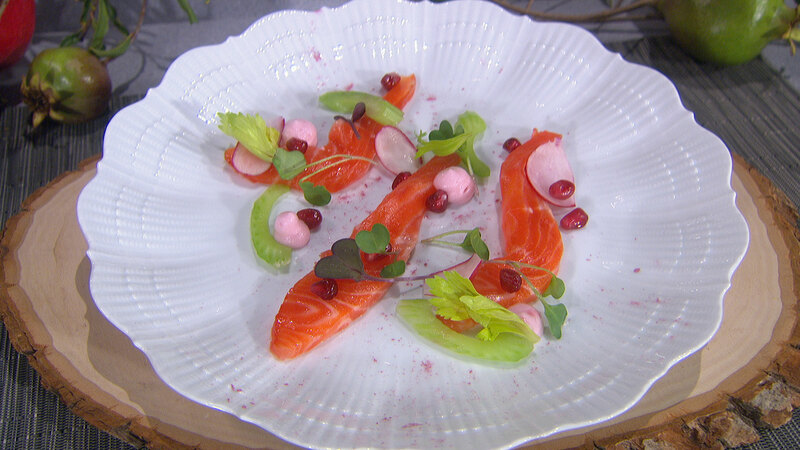 Place 2 pieces of cured ocean trout on each plate. Around the salad, build the plates to include 5 celery slices, 5 celery leaves, 5 radish slices, and 7 radish sprouts. Dot the pomegranate reduction around each plate and garnish with some pomegranate seeds. Using a tea strainer, lightly dust with pomegranate powder and serve. 2. Place the hazelnuts on a heavy baking sheet and roast in the oven for about 8 minutes, or until the center of the nuts are lightly golden in color. 3. As the nuts roast, gently shake the pan occasionally to ensure they nuts brown evenly. 4. Remove from the oven and set aside to cool. 5. Rub the hazelnuts between your palms to loosen the brown husks from the nuts, allowing the husks to fall to the work surface. 6. Discard the husks and chop the hazelnuts. 7. 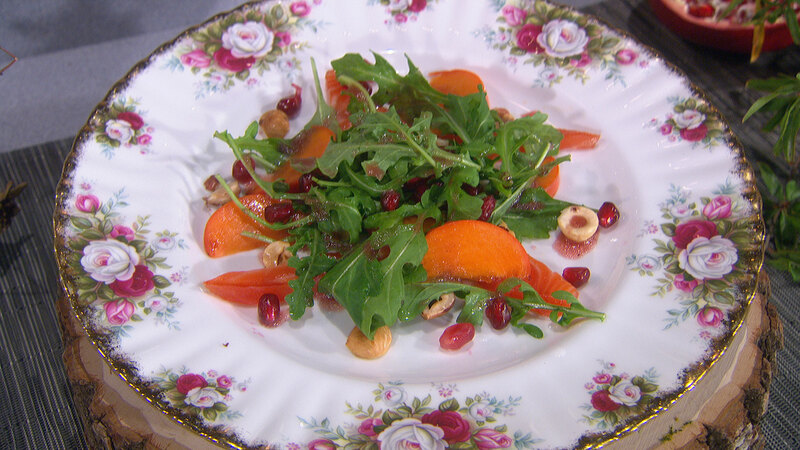 Meanwhile, combine the arugula leaves with the pomegranate seeds and persimmon wedges in a large mixing bowl. 8. In a separate mixing bowl, combine the raspberry vinegar and pomegranate juice and begin to whisk. 9. Slowly add the grapeseed oil and the olive oil to the vinegar mixture while constantly whisking to blend. 10. Season the vinaigrette to taste with salt and pepper. 11. Lay 2 nice slices of the cured ocean trout onto 4 plates. 12. Gently toss the salad with enough vinaigrette to coat and season to taste with salt and pepper. 13. Mound the salad on top of the ocean trout slices. 14. Sprinkle any pomegranate seeds (that have fallen to the bottom of the bowl) over the salads. 15. Sprinkle with the toasted hazelnuts and serve immediately. 1. In a small saucepan, bring the pomegranate juice and sugar to a boil. Reduce the heat and simmer for about 25 minutes, or until the juice is reduces to a syrup consistency. Add the lemon juice (this will result in a sweet and sour mix). 2. Add 1 tablespoon of the pomegranate sweet and sour to each of the 6 champagne glasses. 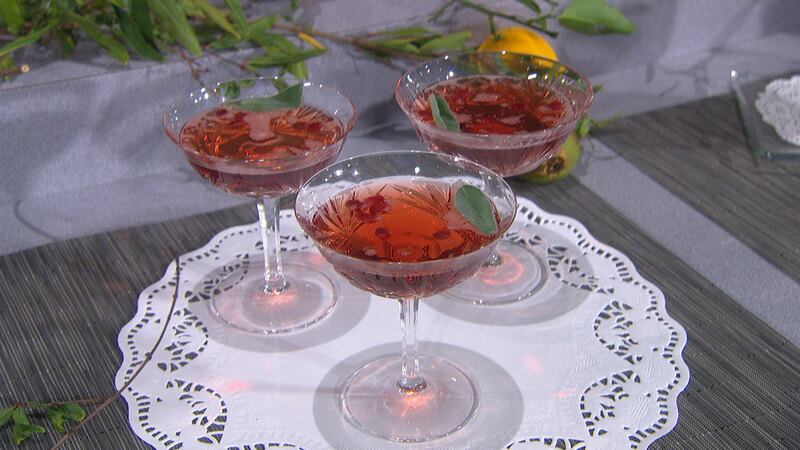 Add 2 sage leaves and 8-10 pomegranate seeds to each glass. Top with champagne and serve. Make-Ahead: The panna cotta and pomegranate can be made up to 2 days ahead. Keep refrigerated. 1. Combine 2 1/2 tablespoons water and lemon juice in a small bowl. Sprinkle the gelatin over and stir to blend. Let stand for about 15 minutes, or until the gelatin softens. 2. Whisk the yogurt and 3/4 cup of the cream in a large bowl. Combine 1 cup of the cream and sugar in a small saucepan. Bring to a simmer over medium heat, stirring until the sugar dissolves. Remove from heat and add the gelatin mixture, whisking until the gelatin dissolves. Add the cream-gelatin mixture to the yogurt mixture, whisking to blend. Pour the mixture into six 6-ounce stemmed dessert cups (such as antique glass saucer champagne glasses). Chill uncovered until cold, then cover and keep refrigerated for at least 8 hours or overnight, or until the panna cotta is set. 3. In a heavy based small saucepan, combine the pomegranate juice and sugar and bring to a simmer over medium-low heat. Simmer gently for about 5 minutes, or until the mixture has reduced and thickened slightly. Cool completely. Refrigerate until ready to use. 4. 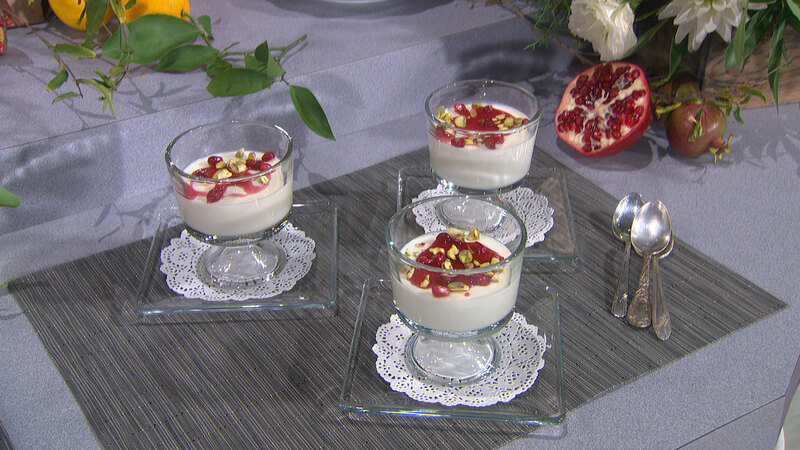 Spoon the syrup over the panna cotta, and then top with the seeds and pistachios and serve.